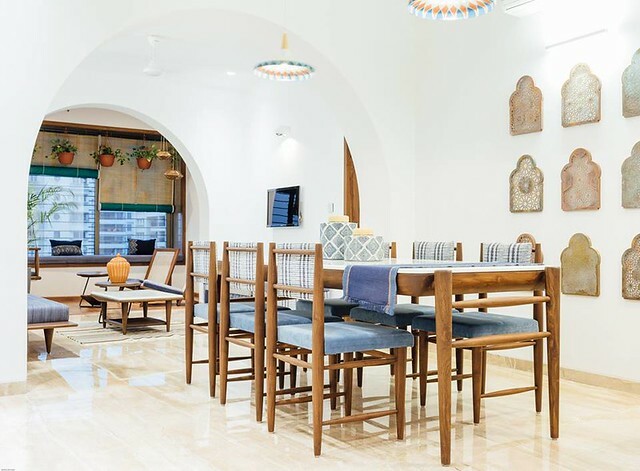 Aangan Architects has designed this Mediterranean-style apartment in Surat for Pramod Mittal and his family. 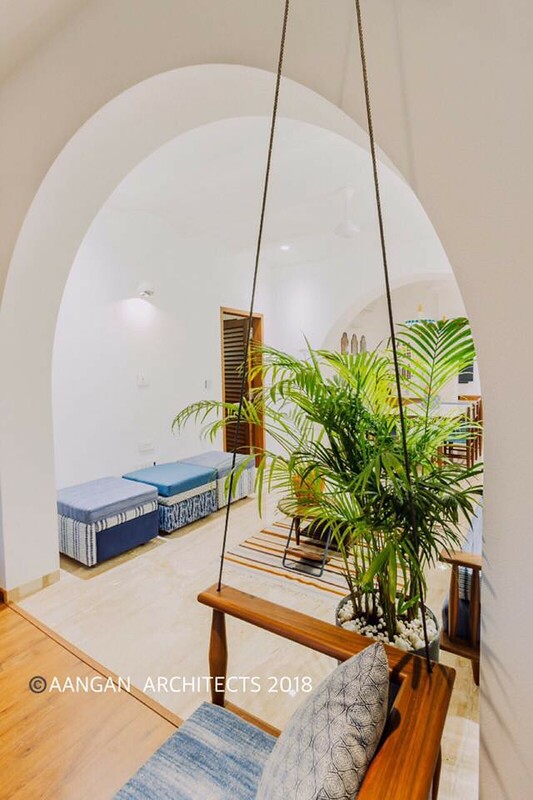 Mediterranean design is anything but straight lines; it is defined by arches, textured white-washed walls with a good dose of blue for windows and doors, and all colours that stem from nature. 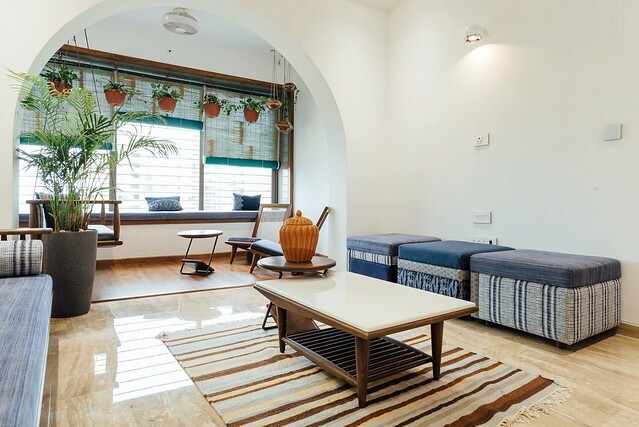 The 2,660 sq.ft apartment is a modern interpretation of this much-loved design style as one often associates Greece or Spain to vacation. 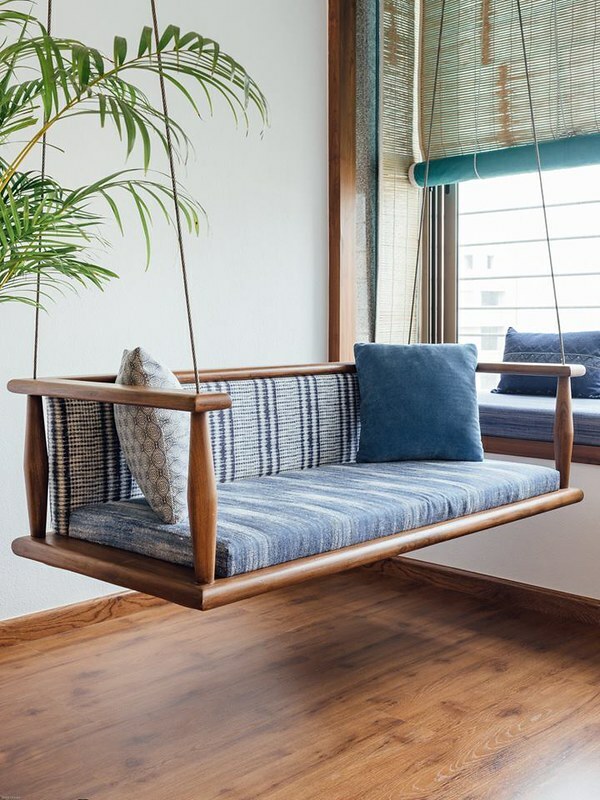 And when you have a home that exudes this relaxing, holiday vibe, you stop yearning for a vacation outside. 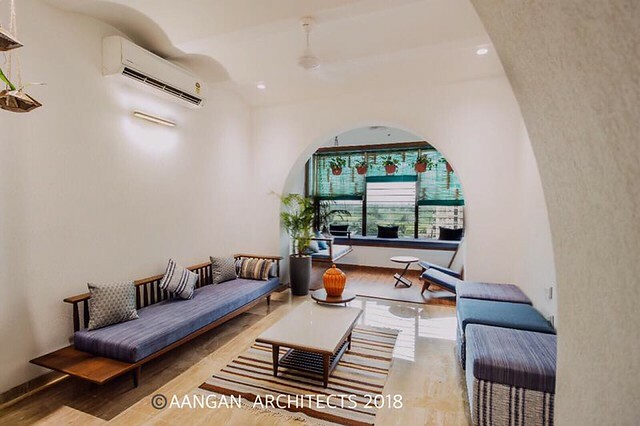 This is a newly constructed 4-BHK apartment that saw no structural changes apart from the arches. The flooring is Italian marble already provided by the developer. Step inside to see the Mediterranean magic unfold. 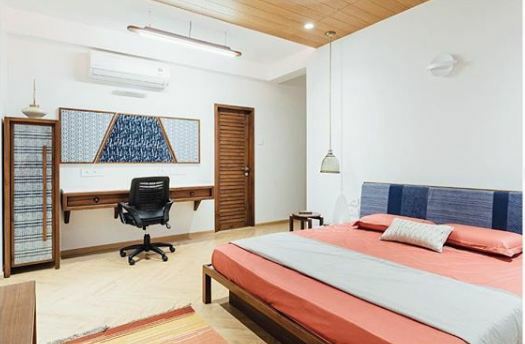 The interior design is as fresh as it gets: the rooms have a fluid flow and a breezy feeling to them. 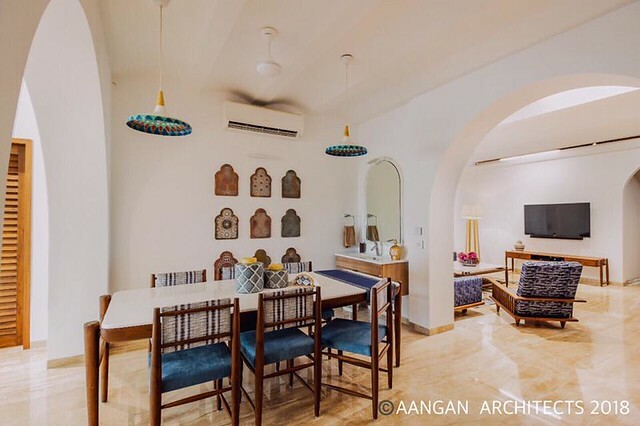 The large arches intercepting the rooms give an illusion of an unending line of sight and space. 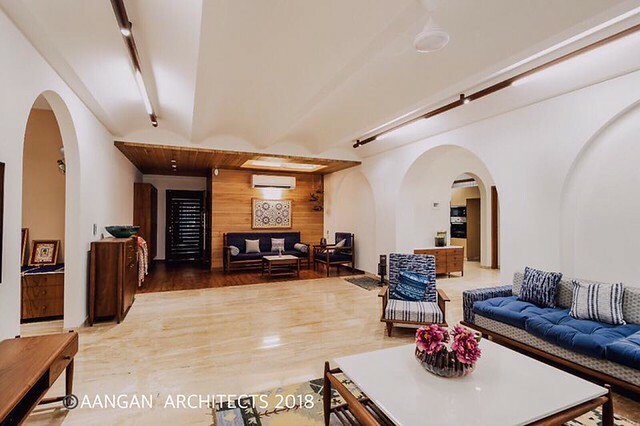 The arch within arch, a key element of the Mediterranean style, is seen here to give that continuity of style. In many ways, it was reminiscent of the old world for me as you see the surfaces are clean of artifacts, accessories and wonder where is all the storage. 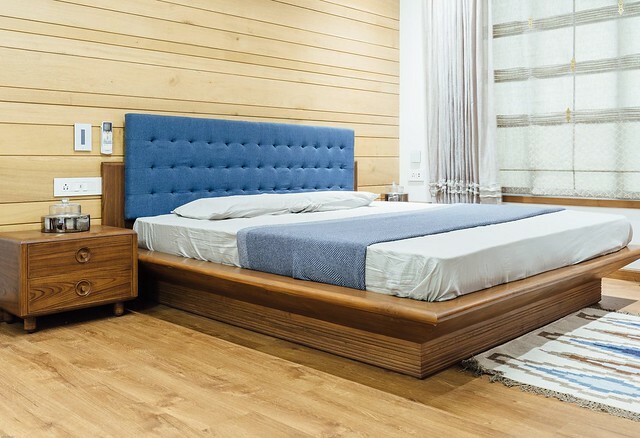 In projects of such scale, we have often see that the furniture and furnishing is an after-thought i.e. pieces are bought after the wood work is complete to mix and match that it defeats the original aesthetic. 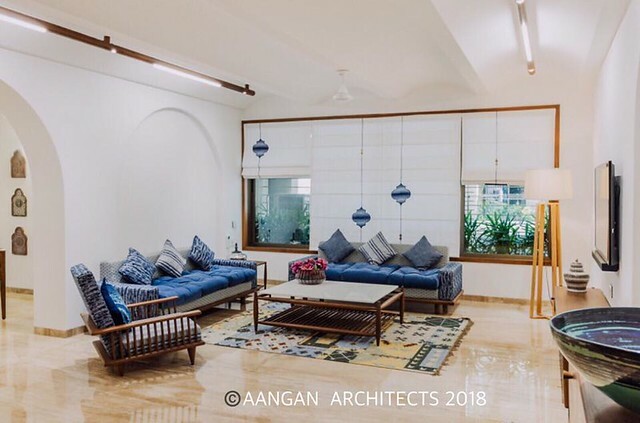 The furniture, furnishings, lighting, and artwork are all the heroes of this project – in equal measure – that tie and reinforce the concept beautifully. 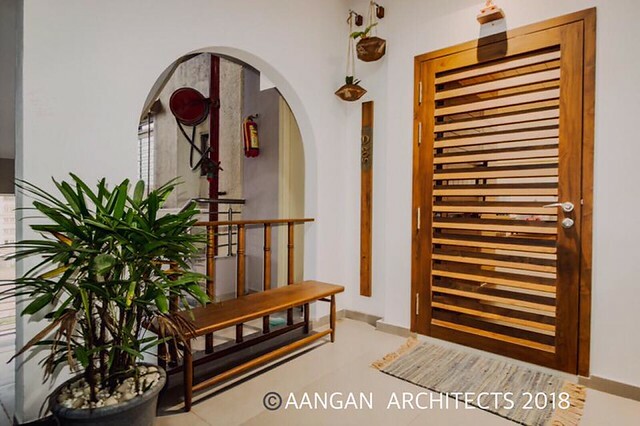 The attention to every subtle detail such as the spot lights, the type of artwork on walls, the patterns on rugs, the planters is what separates the chaff from the wheat. Look closer and you’ll know what I mean. Furniture: There is so much restraint when it comes to furniture here. Intricate carved or inlay work with wavy legs is characteristic of most traditional Indian furniture. 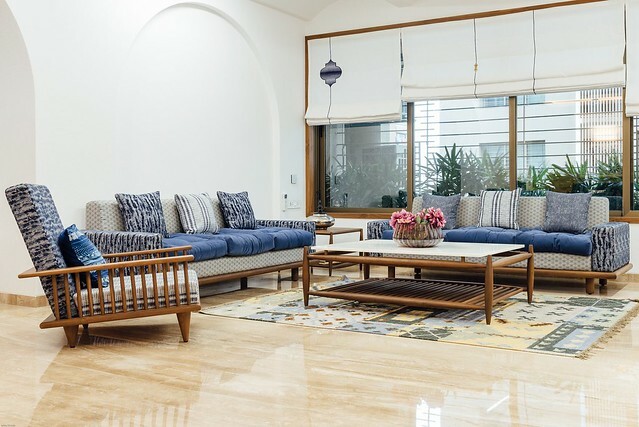 True to the chosen design style, this home steers clear of such furniture and there is no hint of trying to fit in any old piece the family may have had. Spot the pattern on the blinds? The classic Middle-eastern style hanging lamps are an absolute delight as is the gallery wall of Moroccan artwork. 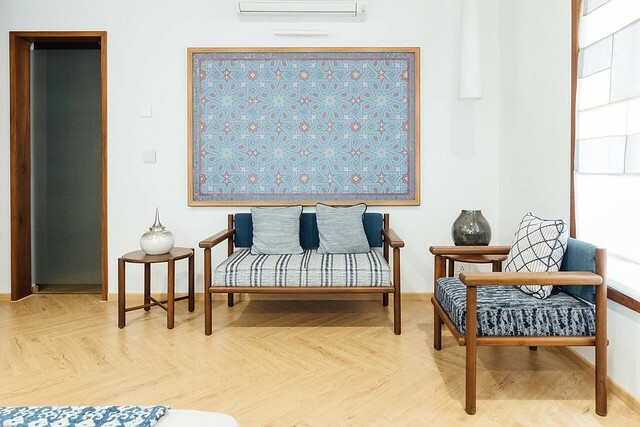 In short, this apartment weaves Mediterranean magic that everyday feels like a holiday. 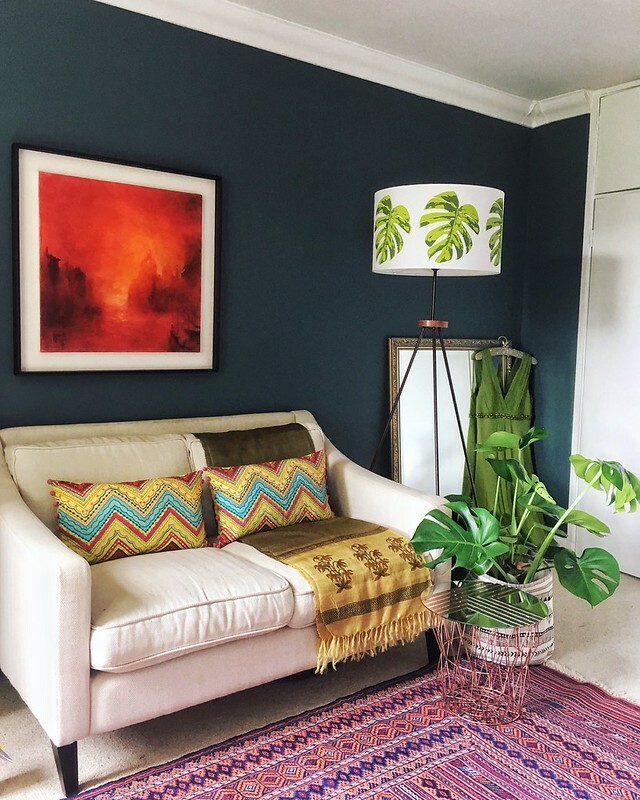 This home tour is the first in a series of two posts. 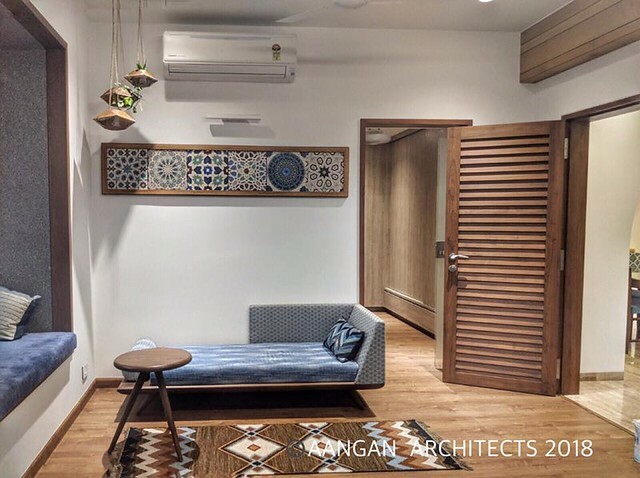 Stay tuned for the next part to be published tomorrow that will focus exclusively on the furniture designed for this project by Design ni Dukaan. This Modernist Home in London Shows How to Get Dark and Moody Decor Right. Hint: With Splashes of Color.